When Owen Thomson of DC's Bourbon was formulating cocktail recipes a few months ago for a throwback of a high school party called "Billy's Parents House", he thoughts back to the types of beverages he used to drink at high school parties. Memories of cheap, cloyingly sweet wine inspired plans for grown-up versions of the once ubiquitous but often mocked wine cooler. Owen and Bar Pilar's Adam Bernbach set out to create more mature versions that while just as refreshing, are more balanced and complex than their Bartles and James or Boone's Farm counterparts (yikes, but horrible memories those bring back for me...) Syrups infused with fruit juices and purees, sugar, water and herbs serve as the basis for the drinks, and a bit of experimenting with different wines allowed them to find the right bottles to pair with the flavorful and aromatic syrups. Add first five ingredients to a medium pot. Bring to a boil, stirring constantly. Reduce heat and simmer for 10-15 minutes. Remove from heat and allow to cool. Strain out solids. Store in refrigerator in a container with a tightly fitting lid for up to one week. 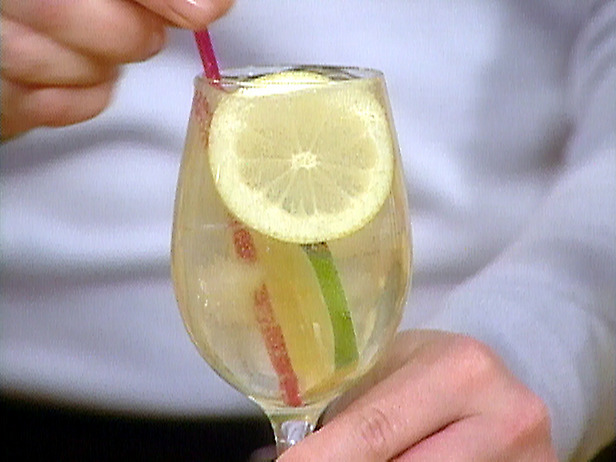 To make the wine cooler: Add ice and a 2:1 ratio of Sauvignon Blanc and syrup to a glass. For a more pronounced wine flavor, use a 3:1 ratio of wine to syrup.